Hey, I'm OK you're okay OK heh? any metrics on bbs games played? The BBS has stars and favorites but does it keep a metric how many times your game got played? Might I propose it does such if it does not. That would be rad. I export my game with "export blah.html" and play the html file in firefox or chromium-browser. When I hold down tab, which is the default player 2 button O, it seems to cause the browser focus to jump up into the address bar, search bar, and around any other anchors of the page etc. By this, it interrupts holding down button O in the game. However, games on the BBS do not seem to exhibit this issue. For example, my same game that I uploaded to the BBS does not have that behavior on its BBS post page (I hold down tab, the focus stays in the game) but it does if i export it myself to html/js and play that file (I hold down tab, now the address bar is highlighted, now the search bar, now the game, repeats flipping around). So there may be something in the BBS HTML that keeps the browser from handling the tab key that way. I see this on Firefox and chromium-browser both. It is cumbersome for my beta testing my game in which either player would typically hold down button "O" to build up strength. I may have to rethink my buttons. Any thoughts? I will look into maybe a little edit I can make to my own HTML exports. Thanks.. Moved to the support category. can memcpy overwrite the sprite bank? 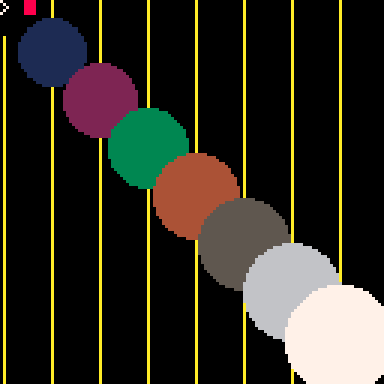 When I do this it copies the sprite 0 (the white x) over my grey circle. And nothing happens. (I hit escape into the sprite editor and it is still the same). Why? Hmm. I was going to populate it dynamically and make spr() and sspr() calls to it.